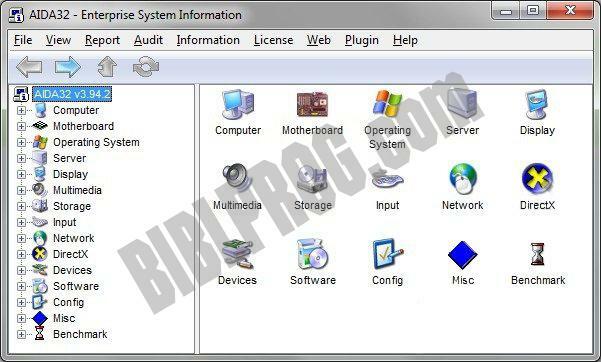 AIDA32 is a professional system information, diagnostics and benchmarking program running on Win32 platforms. AIDA32 will extract details of all components of the PC. You can display information on the screen, print it or save it to a file in various formats like XML, HTML or CSV. For corporate users, AIDA32 offers command-line switches, network audit and audit statistics, remote system information and network management. - Full hardware & software information on 80 pages. - Built-in hardware database: detailed information about 22000 components. - Phyisical information for CPU, motherboard, hard disk, optical drive. - Motherboard chipset, buses, sensor information. - Installed programs, event logs list. - Diagnostics module to reveal possible problems memory benchmark. - Automatic audit via command-line switches. - Remote control through TCP/IP network. - 32-bit low-level hardware detection. - Iomega Active Disk support.